After you pitch the Eureka Titan 8-Person, 3-Season luxury family tent, divide it into two rooms for some privacy or leave it open to enjoy all 128 square feet of space. Get the most out of your tent space with the side wall pull outs. 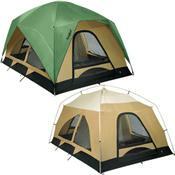 Six extra large windows keep breezes flowing through this tent but protect you and your family from splashing rain. Set the Titan 8 up in a snap with the Eureka hub and color-coded roof panels. This car camping tent is Eureka's best-selling luxury family tent and gives you durability and a massive amount of usable space.